Join us on Facebook for our latest recipes and projects! 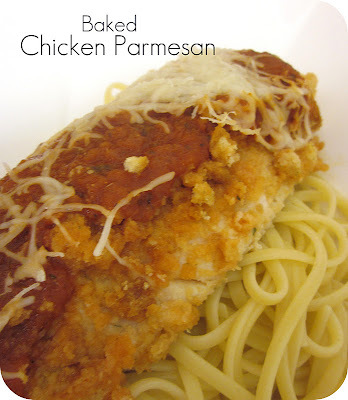 My husband and I love Chicken Parmesan. We’ve been trying to eat healthier this year, so this baked version was right up our alley. My husband never would have known the chicken was baked rather than fried, if I hadn’t told him! Spray baking sheet with vegetable cooking spray. Place croutons in zipper plastic bag. Close and crush with rolling pin until crumbs form. Dip chicken into beaten egg. Coat with crushed crouton crumbs. Place chicken on prepared baking sheet. Spray chicken with vegetable cooking spray. Bake 20-30 minutes or until chicken is done. 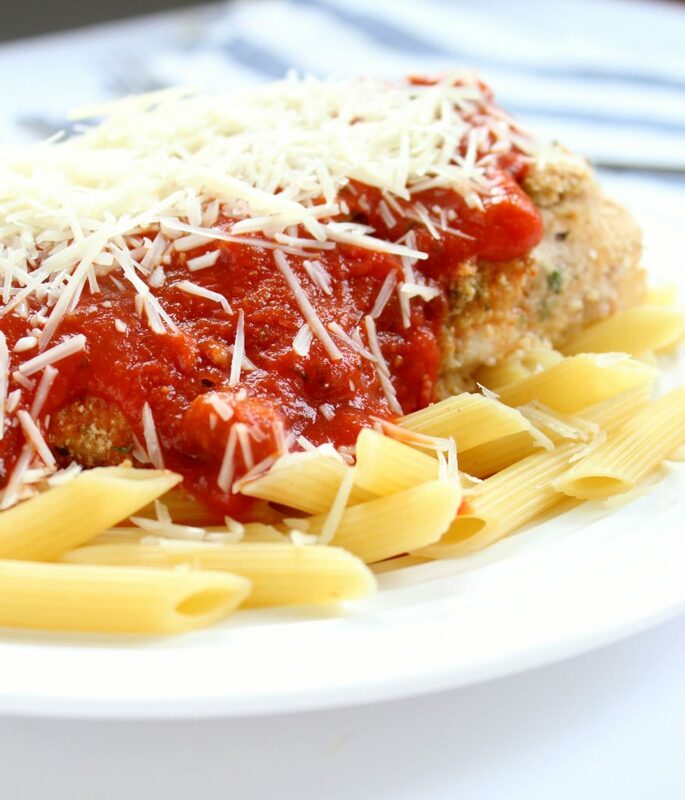 Spoon pasta sauce over chicken and sprinkle with cheese. We love serving this over cooked pasta. Yum! This looks excellent! I have to add it to my list to try. Thanks for the recipe! We are trying to eat a little bit healthier too. Love that this is like fried but really is baked!!!! Oh I wish I checked your blog b4 I made dinner! I made this tonight and it was really good! I made my own spaghetti sauce and served it over whole wheat pasta (I'm so glad it tastes GOOD now...remember when you first saw it in stores and it was disgusting?). My chicken breasts were really thick, and I wish I would have pounded them out first because the chicken was a little plain, and I think it was because the chicken:crouton ratio was too high. I also microwaved each portion for about a minute after adding the cheese just to melt the cheese. I made this last night for a dinner celebrating my mom's retirement. Everyone loved it!I halved my chicken breasts and poured the leftover crouton crumbs over the chicken. Also, after the chicken cooked for 20 mins I turned off the oven, poured the sauce around the chicken, covered in cheese, and popped back in the oven until the cheese was melted.